January is always a time to refresh and renew, whether it's your home or your body. Thankfully, the editors of Everyday Food magazine have offered up a new cookbook that is all about preparing light meals. It's caveat? That all of the recipes be no more than 500 calories. 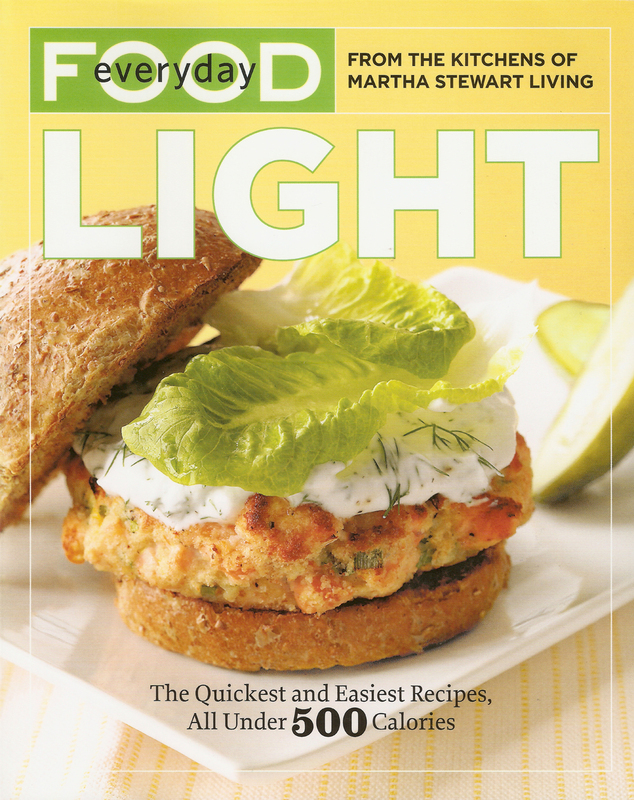 The salmon burger with yogurt-dill sauce and whole-wheat bun you see on the cover below, for instance, is just 332 calories. Pretty amazing. To tell you the truth, I am not really a calorie counter. As Julia Child once said, "People who love to eat are always the best people." Very true, indeed. I love food more than I can really express. In fact, before I go to bed each night, I secretly plan my breakfast so I have something delicious to wake up to. This is why I am not generally a fan of 'diet' cookbooks, fearing the recipes inside will be flavourless, pulpy and filled with lists of hard-to-find ingredients. 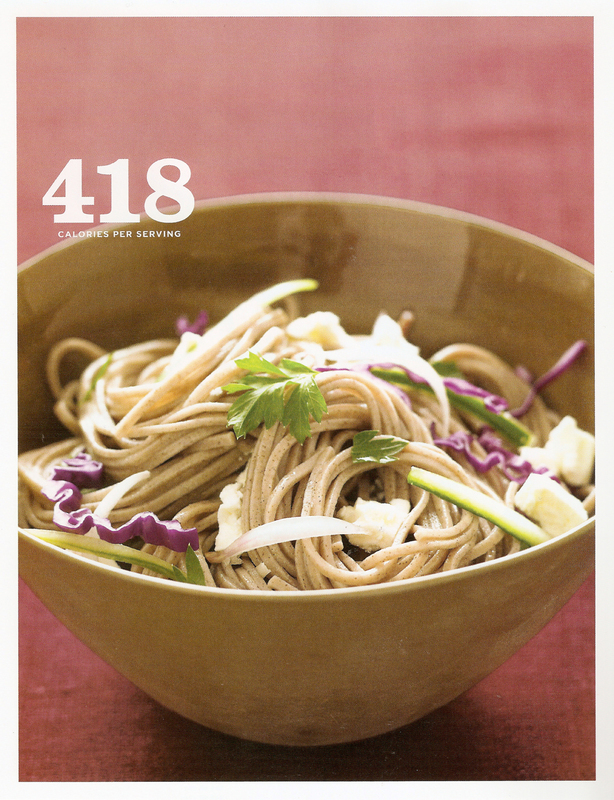 What I have come to love about Everyday Food (the magazine, and the three cookbooks the magazine has developed so far) is that I can rely on the editors to count the calories for me and to present an array of meal options that involve simple, at-the-ready ingredients, fast prep times and delicious flavours. Everyday Food Light does all of that. 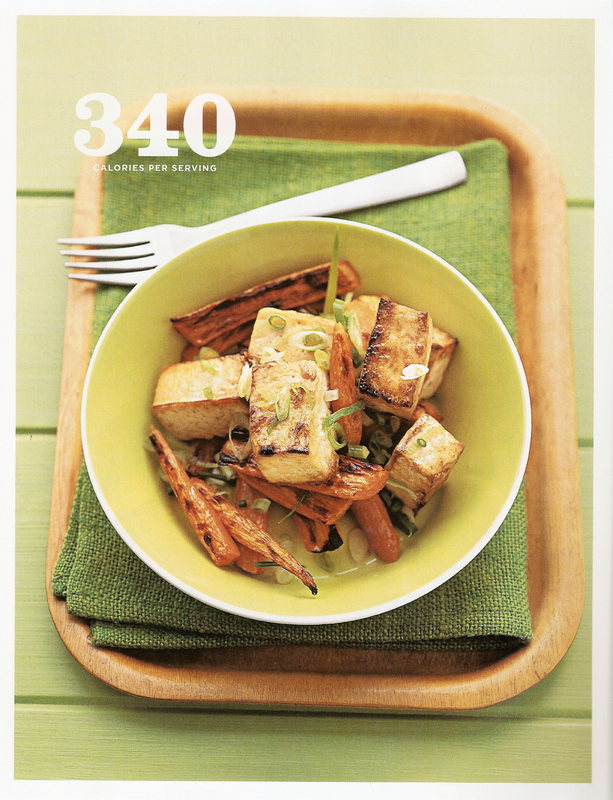 Soy-glazed Tofu and Roasted Carrots: a light Asian dish packed with flavour, not calories. The book divides its recipes by season, which is probably the most effective way to organize a cookbook, although organizing by meal, course or time of day is also handy. 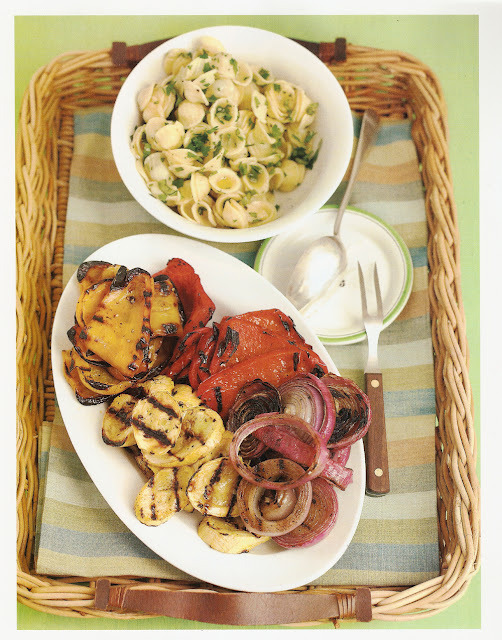 There are 203 recipes in the book, subdivided by meal within the seasonal chapters. And, again, each recipe is under 500 calories. The editors are very careful to boldly state the calories on each page and also provide helpful insight as to why the recipes are light and healthful: explaining the health benefits of certain ingredients and ways to enrich flavours. Following an introduction from Martha, the book begins with a very excellent chapter that outlines a number of ways to cook healthier meals. There are the "Golden Rules for Eating Light," which I will outline below, and informative sections on healthy cooking methods: poaching, steaming, cooking in parchment, stir-frying, roasting and grilling. (No, folks, deep-frying is not on order.) There is also a helpful guide to the tools any kitchen should be equipped with in order to assist with light cooking (steamer baskets, roasting pans, parchment paper, immersion blender, grill pans, etc.) followed by an excellent list of flavour-boosters to help enrich the process of cooking light with that much-needed dose of deliciousness: marinades, dry rubs, herbs, spices, salsas, citrus juices and zests, etc. I highly recommend this book for anyone who wants to try their hand at lighter cooking or simply add a few lighter options to their repertoire. I also think this is a great book for anyone interested in vegetarian cooking. While it is not designated as a vegetarian cookbook (there are many recipes with meat and fish for the carnivores among us) most of the book highlights the goodness of vegetables and fruits, grains and meat substitutions, such as tofu and beans. Some of the recipes could likely be considered vegan, although they are not labeled as such. Check it out at your local book store or order it from Amazon here. I don't think you'll be disappointed. Below are the golden rules of eating light that the book provides in its introduction. Rethink your routine: Instead of frying or sautéing, try lower-fat cooking techniques such as steaming, poaching, grilling and roasting. Make simple substitutions: Use yogurt instead of sour cream; instead of full-fat versions, use reduced-fat varieties of milk, cream cheese and mayonnaise. Try partly-skimmed mozzarella and ricotta cheese. Go easy on the oil: Rather than pouring oil straight into a pan when cooking, parcel it out with a measuring spoon. Or use a pastry brush to lightly coat the pan and the food with the oil before roasting. Up your vegetables: Increasing the number of vegetables on your plate and reducing the amount of meat is a simple way to cut fat and calories and increase the level of nutrients in your diet. Opt for lean protein: Choose lower-fat meats, such as skinless chicken and turkey breast, or beef and pork tenderloin, instead of rib-eye and Porterhouse. Eat more fish and meatless proteins such as beans and tofu. Slim down your salads: To keep your salad more healthful, make your own vinaigrette using less oil than store-bought versions, or use low-fat buttermilk in creamy dressings. Toss the salad with just enough dressing to coat and cut back on fatty additions such as cheese and croutons. Add fat-free flavour: Instead of relying on fats like butter and oil, enhance your dishes with vinegar, citrus juices and zests, spices as well as fresh and dried herbs. Fill up on fiber: Beans, whole grains and legumes are relatively low in calories yet packed with fiber, which helps you feel fuller longer. Choose sweets wisely: Make a low-fat treat for dessert, such as angel-food cake instead of cheesecake, granita instead of ice cream, or enjoy just a few squares of bittersweet chocolate. This book has inspired me to eat healthier, I love it so much!!! A very pretty edition. Bottom line - which I keep drumming into my thickened skull as I age - is that one needs to burn more calories than one consumes. My old salad slimming tip (and force yourself to eat a BIG salad slowly): ask or have dressing on the side; dip the tines of your fork into the dressing; spear fork into salad. Repeat ad libitum. As we slim down from the holiday glut, we also may try "Oprah" tips, such as french fries baked by coating with beaten egg whites. I like to head into the holidays deliberately underweight. All the best as we swerve into Valentine's Day. Thanks for the great blod, Andrew. I bring a big salad to work-- takes me all day to finish it. dressing is red wine vinegar olive oil fresh ground black pepper garlic powder on the lettuce, not iceberg baby spinach, cucumber match stick carrots, mushrooms, green pepper lots of scallions garbonso beans sometimes grilled chicken added not a whole lot --or julienned ham for the flavor honestly a big salad and oh thick skin as co workers comments are you a vegetarian do you eat meat( day after day it gets old but just smile and then you realise how simple minded some people are)(start eating salad and you could earn a sociology degree by life experiences) -- if you are busy at work-- salads are light and filling and easily digested and well how can you enjoy other "meals" in a work place lunch room salads require no cooking and well fast -- I also bring my cooler to keep my salad ice cold and there is one less person vying for space in the break room fridge they should thank me for freeing up space.